A Backwards Progress - Homestead Edition: Merry Christmas! 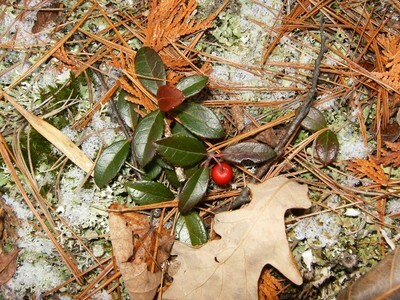 During a walk in the provincial park the other day I finally saw my first ever wintergreen berry! I remember seeing tons of wintergreen in the summer, making tea from it when camping, but I don't remember ever seeing the berries before. They had practically taken on mythical proportions in my mind! You can eat them, although I didn't. -It has a minty taste which is now synthesized or made from birch twigs for gum, candy etc. -Young leaves are tasty in salads, older leaves for breathe freshener and tea. -Too much pure wintergreen oil can cause kidney damage and poisoning. -The fruit is spicy and strong-tasting, and best after a winter on the plant. -The berries were traditionally used for a wild game sauce, or to flavour beer! -Methyl salicylate, a compound related to aspirin, is found in the leaves, which may be why it's traditional uses include: remedy for headaches, sore throats, rashes, sore muscles, hookworm*, and venereal disease (now this blog will come up with a search for venereal disease!). Taken from: M.A. Leduc. The Explorer's Guide to the Boreal Forest.